Park City is beautiful western ski resort filled with galleries and fine restaurants. It’s known for the best powder skiing in the world. You’ll be taught by Olympic coaches using the same techniques they use to train Olympic athletes to win medals. Our coaches take full advantage of the different terrain to help you experience and realize a whole new way of skiing mountains. Our guest to coach ratio averages to 5:1 ensuring you lots of immediate feedback, focus and personal attention. No matter what your ski level is, you’ll come out a more confident, competent, and capable skier. And you won’t just learn – you’ll have more fun than you thought possible on two skis. There’s a world of difference between the typical mountain resort ski instructor and an Olympic ski coach. Very few golf pros, club-level tennis instructors or ski instructors have a deep understanding of sports psychology, kinesiology or biomechanics. Consequently, although they mean well, many times they teach in a way that hurts their students. Plus, their knowledge of biomechanics and kinesiology allows then to understand how a change in foot position will create a chain reaction impacting the ankle, the knee, the hips and ultimately what the body does. So they teach in a simpler way that results in faster progress. Watch the video where US Olympic Ski Coach Bill Baum explains how he coached Olympic athletes and Wounded Warriors. Bill and his team are committed to help you reach a new level of skiing. Bill Baum was the US Ski Coach at the Nagano Olympics and US National Team Coach. He’s worked with the US Navy, the US Marine Corps, General Electric and Allstate Insurance to help them with employee training and performance improvement using sports coaching techniques. He’s currently the Aerospace and Military Solutions Director for Stahlwille Tools. Bill is a world class sports photographer. He works side by side with ESPN and National Geographic photographers on projects around the world including many projects for the US Olympic Committee. As Head Coach of the Olympia Ski Camp, Bill and his team will help you catapult your progress so you can reach your skiing goals. You’ll stay in a beautiful mountain lodge minutes away from town. We just want you to enjoy yourself as you create unforgettable memories. or we can mix in other activities. Experience the “Champagne of Thrills,” a bobsled ride at the Olympic track. 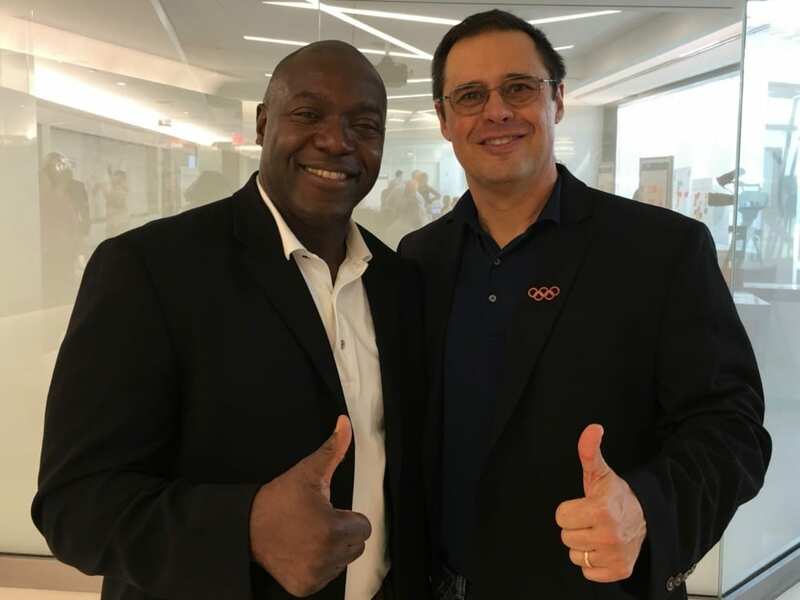 Ruben and Pat Brown, the coach of the original Jamaican Bobsled Team. Spend a whole morning, two full hours, snowmobiling in some of the most pristine backcountry in Utah – a 60,000 acre ranch up at 11,000 feet. We’ll follow the guide through the woods to a large flat area where we get to snowmobile freely for twenty minutes. Snowmobiling in huge circles in this area makes you feel like a modern Ben Hur racing chariots. Then we’ll go higher in the mountains to a section of bowls where you’ll get to snowmobile as hard as you like. You can climb up the bowls, hammerhead and fly down. You can really push the limits. Or if you prefer, you can take it easy and enjoy the stunning views at a slower pace. You’ll visit Soldier Hollow, site of the cross-country ski events and the biathlon competition. Ride up the mountain in an old fashioned horse-drawn sleigh. Ride through the beautiful slopes of the Park City Mountains to a genuine mountain lodge. Enjoy a wonderful dining experience with live western entertainment before relaxing on your sleigh ride back down. A special evening that will make you feel like you went back in time. An extraordinary Ski Camp for extraordinary people.